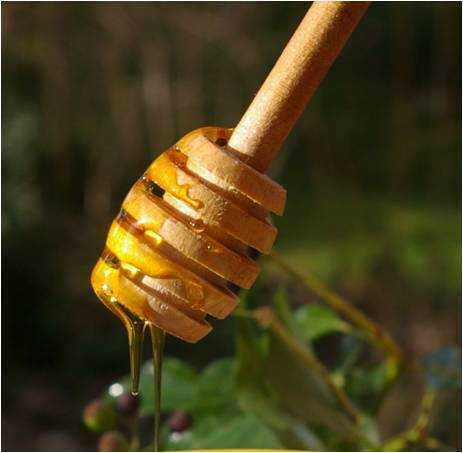 Here are links to pages providing lots of information about honey. Simply click on the headings to learn more. A description of honey, explained by scientific formula, and information about the different types of honey. It's actually the winter stores of food for honey bees! This page explains more. It takes a huge amount of effort for honey bees to make honey. This page describes the process and the work of bees. Some quick facts about honey. For example, did you know honey is the only food made by insects, and eaten by humans? How about mixing honey with a pig’s eye, then pouring it into the ear to cure blindness? Ever wondered what New Zealand Manuka honey is, and what's so special about it? Are they really so different? A comparison of sugar versus honey. Information about the nutritional content of honey. Buying honey and avoiding contaminated products. From cakes and tea breads to salad dressings. What is Cactus Honey, and is it made by bees? Why does honey crystallize, and what can you do about it? There are various substitutes for honey, whether you are looking for a replacement in a recipe, or you're interested in using it as beauty treatment. Honey and vinegar have been combined to aid weight loss.....but what does the science say? Is honey suitable for diabetics? Actually - no! Here's the information. Producing and buying certified organic honey is not an easy business. Find out more here. A break down of the calorific value of honey. From honey and cinnamon cures to apple cider vinegar and honey diets, and honey and vinegar remedies, are there any health benefits of honey, or is it just old wives tales? A look at some of the claims made and why honey is sometimes added to various beauty treatments. Can honey help you lose weight? Information here.